Love skiing? We do too! we’ve got something to offer you. What’s included? Lessons include instructor, equipment, use of the slope, and all the abuse (friendly!) the instructor might throw at you. Please note that ALL sessions need to be pre-booked with the exception of Saturday and Sunday Open Practice. What is Open Practice? This is only open to people who are currently having tuition with us or have had tuition with us previously. Please take a look at the relevant section below. You have a choice of private lessons, courses and group sessions, all of which allow you to pop back afterwards for some open practice. Everyone needs a lesson or two. It’s what makes us awesome skiers! If you have ever skied before, you ARE a skier, however little it was, and however long ago. The body is an amazing thing, and it will remember what it has done before, even if you can’t! We don’t run courses for skiers because everyone will be at a different point, and have different things they need to work on, so private lessons are the way forward. We can tailor the lessons to suit your needs, so we can rub the rusty bits off before you go away, take your skiing to the next stage, help you break out of that intermediate plateau, help you if you are plain scared, or do just about anything else you might want. One hour private lessons are available 7 days a week, all year round, from early till late, for up to 6 people, (all participants should ideally be of a similar ability). These are 1 hour sessions for up to 6 people (aged 9 years+) where you get the instructor to yourself. If you would prefer not to learn in a group, or our course times are inconvenient, then this is the way to go. Private lessons are available 7 days a week, all year round, from early till late. As a simple rule of thumb 3 hours of private tuition will get you to the same level as a beginners course. 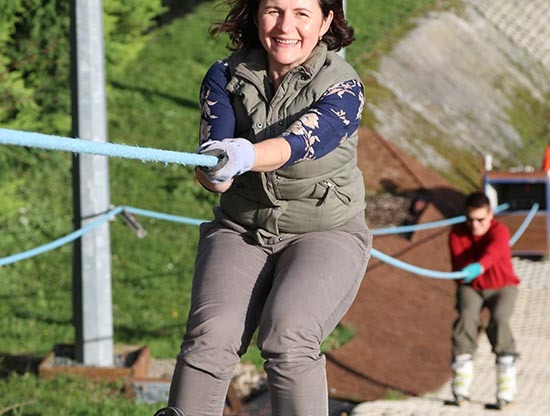 We also offer Family Lessons for mum, dad, and up to 3 of their children, which are more economical than standard private lessons but still provide you with your own instructor for the hour. Private lessons are from £55 per hour, for more details check out our prices page. For the majority of people a Beginners Course is the most cost effective way for an individual to learn to ski. By the end of the course nearly everyone can use the lift, control their speed, and make basic turns. Adult courses consist of 4 one and a half hour lessons, and are available from age 12 upwards. They usually run for 4 consecutive weeks and have a minimum of 5, maximum of 10 participants. Junior Beginners courses for 9-15 year olds run during half term and holiday periods, and usually consist of 4 one hour sessions. If a course is undersubscribed, it will usually still run but for a shorter duration. The cost for an adult course is £100, and a junior course is £60 – for more details check out our prices page. To see times and dates for Beginners Courses, please go to either the Adult Beginners Courses, or the Junior Beginners Courses. Especially for the little people! Little legs get tired quickly and younger minds have a shorter concentration span, so we run half hour Junior Private Lessons for 5-8 year olds. 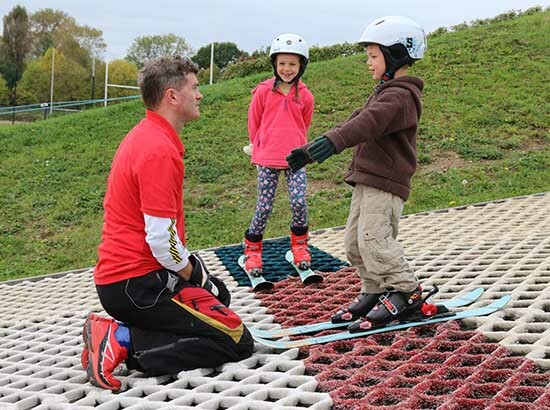 Our lessons place an emphasis on FUN because when the kids enjoy skiing – you will too! Sessions are for a maximum of three children, who all need to be of similar ability. Generally children over 8 can cope with an hour’s lesson, but if you’d like one of these shorter sessions please ask. Please note, latest booking weekdays is 5.00 pm. If there are more than 6 of you who want to learn together, you qualify for one of our group rates. Everyone needs to be at a similar level of skiing for group lessons. If you have a beginner, then they need a beginner’s lesson first. Group lesson – £16 per person, minimum group size of 7. A group could be 2 families learning together, a birthday party, a work social event etc. Youth Group lesson – £10 per head, minimum group size of 10, minimum age 9 years. If you are organising a group for a specific organisation, eg Scouts, Guides, holiday camp activities, church groups, this is the rate that applies. School Group lesson – From £9 per head, minimum group size of 10, minimum age 9 years, only available before 6pm weekdays. Ideal if you are running a school ski trip. If you are only booking 1 session, or would like to bring a school group at any other time, the youth group rate applies. All group lesson rates quoted are for an hour, with one instructor, and include kitting up time, so that an hour’s lesson will not be a whole hour on the slope. If everyone watches our kitting up video (at the bottom of the page) before they get here, it speeds up the process. If you want a longer session, we can do one and a half hour sessions at a pro rata rate. For school and youth groups you will be entitled to a second instructor when the group size gets to 20; otherwise if you would like a second instructor for a large group you would need to pay for 20 skiers. 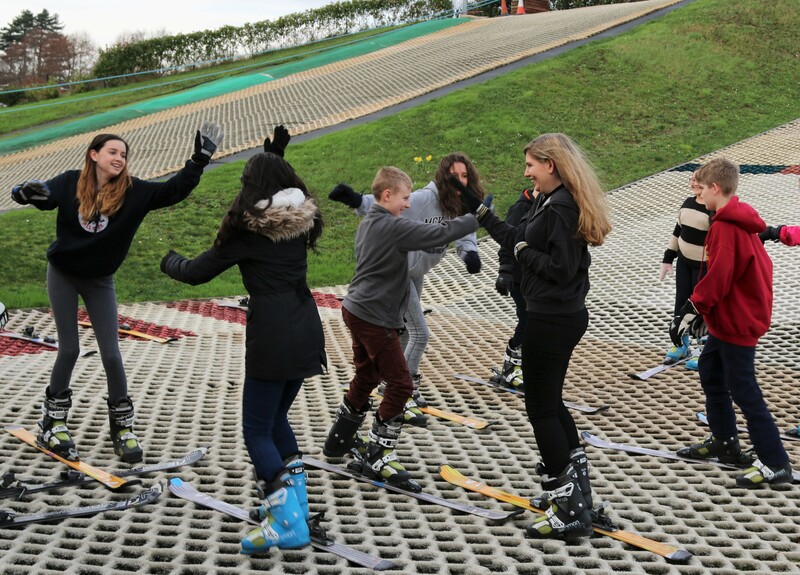 Another option for large groups is to split into two groups and have one group skiing whilst the other group donuts, and then swap round for the second hour. Setting everyone’s skis up correctly can take a little time on the first session. So that we can do this as quickly as possible, we ask that you send us everyone’s height, weight, shoe size, age and ability details beforehand, by filling in our Group Booking Form. We can be quite flexible, so please get in touch to discuss what you’d like to do. We run several ski courses at regular intervals from September through to March. Please select a course button to view more information. We only run courses for beginners, because once people have mastered the basics, everyone has different things they need to work on, so we find that Private Lessons are a much more effective way to learn. We don’t run any courses for under 9’s because this age group tends to need the much more hands on, 1 to 1 approach, of a Junior Private Lesson. All of our courses consist of 4 sessions. If you are unable to attend a session on a course we would need you to have a private lesson to catch up on the content you had missed, this is pre-requisite to re joining the course on which the other pupils would be ahead of you. If there are less than the minimum number of people enrolled on a course, it will still run, but for a shorter length of time. If you are not happy with this we will refund the course fee. Please note that course fees are not refundable for any other reason. Courses consist of 4 one and a half hour lessons, and are available from age 12 upwards. They usually run for 4 consecutive weeks and have a minimum of 5, maximum of 10 participants. If a course has less than 5 people on it, it will still run, but as a shorter course – with the smaller group size you get more goes, so the end result is the same. For younger skiers please see our Junior Beginners Course. The total cost for the course is £100 per adult (16+ years) and £90 for 12 – 15 year olds. For dates and times go to the Beginners Course Information page. These courses are run during school holidays for 9-15 year olds. They usually consist of 4 one hour sessions on consecutive days and are an economical way for this age group to learn the basics. Minimum group size is 5, maximum 10. If a course only has less than 5 people on it, it will still run, but as a shorter course – with the smaller group size you get more goes, so the end result is the same. The cost for this course is £60 per person. For dates and times go to the Junior Course Information page. Open to people who are currently having tuition with us or have had tuition with us previously . An opportunity for skiers to practice all those new techniques or just have some fun. Open Practice is available on Saturdays 4.30-6.30pm, and Sundays 1.30-2.30pm during the winter (1st September to Easter). 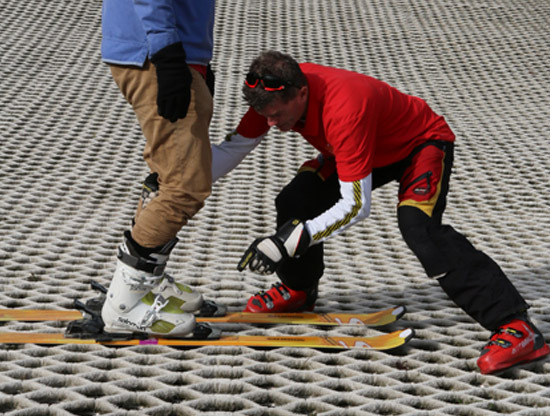 To attend you will need an Open Practice Passport that your instructor will supply, once you have attained sufficient skill to use the slope safely. The Club reserves the right to remove without refund any persons whom the staff feels are dangerous to themselves or others. Never been on skis before? Have a look at this video and it will explain how the equipment works, and how to put your boots on properly. This will save you time on your first session – and help you to get a bit excited about it!